Finally, the ingredients are complete. I found time cooking this Philippine delicacy today. The procedures were quite simple and it was really easy. The ingrediens were also easy to find in any supermarket and it maybe available on your own kitchen. You just need 3 cups of sticky rice flour, 1 1/2 cups of water, coconut flakes, 1 cup of sugar and 1/4 cup of sesame seeds (toasted). At first, you just need to combine the flour and water then blend it thoroughly. Put some flour on your hands then shape dough into egg-size ovals then flatten it with thumb. Afterwards, drop them into boiling water and wait for it to float then scoop it out from the water. 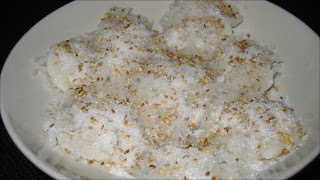 Roll in coconut flakes and serve it with sugar mixed with the toasted sesame seeds. Alas, you have something to eat in just those simple steps. wow best galing mo tlga!!! mukha masarap! Ang daya mo... di ka nag-share! ha ha ha ha... meron pa ba? @best... punta ka na dito... sabi mo nagpasa ka ulit resume? hehehe.. ano ng balita? yup nagpasa ako ulit sana this time na!